Video Pro X was designed to meet the requirements of ambitious and professional film makers. Now, 10 years after release of the first edition, you too can experience the perfect combination of efficiency, performance and versatility. Make exactly the movies you want to make. Take advantage of state-of-the-art video editing tools. Designed in collaboration with professional film makers. And optimized to give you a quick and smooth video editing workflow. When it comes to video editing, there's only one thing that matters: getting the best quality possible with the least amount of work. The complete range of MAGIX editing tools for simple and advanced projects alike — all in a single package. Quickly and efficiently turn demanding projects of your own into reality. Useful shortcuts and a convenient toolbar make it easy. An additional source monitor provides you with a before and after view of your movie at all times. Also included: 3 & 4-point editing as well as multicam editing for up to 9 cameras. Optimize video sound directly in Video Pro X. Whether for restoring damaged audio tracks, mastering or for generating sound effects, dialogs and movie music. Direct access to audio cleaning tools, a realtime audio mixer and tons of mastering plug-ins right within the program. Plus, direct access to additional audio plug-ins via Video Pro X's VST interface. Save time so you can focus on what matters most: with nested sequences, you can add finished sequences to your movie as entire objects. Effects are then applied to the entire object and no longer need to be carried over to each scene in the sequence. With its new, fully automatic 360 image stabilization feature, special 360 transitions, integrated stitching and a 360 effects package from HitFilm, Video Pro X is your all-in-one solution for 360 editing. Video Pro X can handle 360 videos from all standard 360 cameras in up to 4K quality. Crystal clear sound and clean frequencies — made possible by smart automated features and high-quality audio cleaning tools. Easily apply high-end audio effects at channel level via the integrated effects track. Includes EBU R 128 standard loudness normalization for television. Make Video Pro X a part of your production environment: the program integrates seamlessly into your existing video studio. A dedicated preview monitor can be used in conjunction with the HDMI output on your graphics card and a direct interface with Blackmagic Intensity/DeckLink. No matter how you choose to edit your videos, you can rest assured the results will be broadcast-ready quality with a resolution up to UHD. Take advantage of complete creative freedom to turn all your movie ideas into reality. Use Video Pro X's customizable effects, masks, color grading and lookup tables to change the look and feel of your videos. Add a new level of meaning to your footage with professional chroma keying. For impressive quality. Trim your movie material to perfection — with Video Pro X's complete color correction package. Whether you're dealing with color distortions caused by your camera or its settings, Video Pro X's primary and secondary 3-way color correction, along with authentic color space handling, helps you get exactly the image profile you want. Plus, Video Pro X provides a range of advanced illumination features which can be applied using curves. Use Lookup Tables (LUT) to give your videos a specific feel. Thanks to LUTs and their color value, gamma, brightness and contrast combinations, and you can now give your videos any look you want, whether its a specific camera look, cinematic color effects or film characteristics. Use the Lookup Tables contained in Video Pro X, find free LUTs online, or create and save your own. All you need to do to apply LUTs is make sure your recorded material is flat (i.e. relatively neutral). Create abstract versions of your videos with creative effects such as HDR and blur. Use Video Pro X's precise chroma keying feature with antispill to seamlessly insert cropped objects into other videos. Your very own box of creative tools for turning any idea into reality, including a wide range of effects to ensure you always stay inspired. Full creative freedom: create your own effects, captions and titles! Use masks to apply effects to specific areas of your movie. And combine your own effects with effects from the newly integrated in-app store. Get access to a wide selection of high-quality intros/outros, titles and transitions. Enjoy 100% creative freedom — only with Video Pro X. Video Pro X includes a professional object tracking feature which you can use to track titles, text and graphics. Pin graphics and text elements to moving persons and objects in your movie. You can also pixelate faces or license plates so that they are unrecognizable if you are concerned about privacy issues. To ensure lossless color rendering in projects, Video Pro X includes precise measuring instruments, including a vectorscope, waveform monitor, histogram and RGB parade. True color space handling and 16-bit deep color support guarantee color-true processing for your production workflow from start to finish. Take advantage of maximum hardware acceleration for encoding and decoding as well as NVENC support for export, courtesy of NVIDIA. Get comprehensive color correction with 16-bit deep color. And thanks to integrated proxy editing, editing long and demanding movies is as smooth as butter. Full performance video editing thanks to optimal CPU and GPU usage. Hardware-accelerated encoding and decoding (H.264, H.265). HEVC/H.265 video export is now backed by NVENC support from NVIDIA, which makes it possible for the first time to outsource export processing to the GPU's hardware encoder. Plus, with proxy support and preview rendering, video editing is as smooth as ever. Fine color grading and full detail precision when applying strong color corrections — thanks to 16-bit deep color processing, now with 65.536 colors per channel instead of 256. Perform lossless video editing on your source material — from import to effects editing to export. Video Pro X supports all standard video formats, including AVCHD (Progressive), NXCAM, XAVC S, XDCAM or HEVC/H.265 and also professional formats such as AVC-Intra and DVCPRO. The open Timeline in this video editing program allows for easy import and editing of different formats without the need to convert them beforehand. Use external plug-ins to take Video Pro X's functionality to the next level with the integrated OpenFX interface. Multithreading support also makes it possible to use high-performance plug-ins which require the use of more than one processor core. Now, nothing stands between you and complete design freedom. Create DVDs and Blu-ray Discs with professional authoring functions. Select from a range of animated templates for menus or create your own. Store templates you've created for future projects or use them for further editing in other programs such as Xara Designer Pro X. What's the secret behind Video Pro's success? The close cooperation between MAGIX developers and customers. Together, we're improving Video Pro X to create the ultimate user-friendly video editing program. 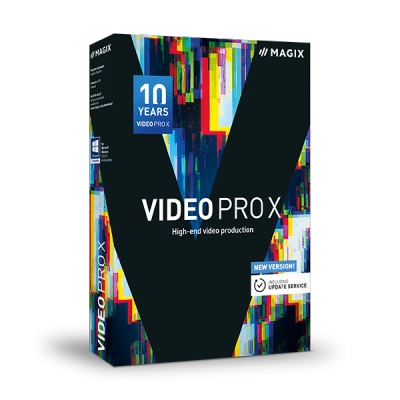 Experience the biggest leap forward in the history of Video Pro X for yourself with the new anniversary edition. We've accelerated HEVC-/H.265 video export for the first time with NVENC support from NVIDIA. The result: A new record for speed. We are finally 100 % satisfied with the object extraction . Thanks to simple removal of green edges and the new, precise object extraction algorithm. Endless new design possibilities for you! Our award-winning cutting tools are now even better than before, and we've also topped them off with a selection of new editing features. With its time-saving J-L cut feature and a brand-new mouse mode, Video Pro X's video editing workflow is nearing true perfection!